The contours of certain facial features can have an effect on the entire look of the face, and many people can achieve beautiful, natural-looking facial enhancement by refining and recontouring these features. Lip augmentation and chin augmentation are two of the procedures offered by Dr. John Vartanian that can help you renew your facial appearance. Lip enhancement can add volume and definition to your lips, ultimately giving them a more youthful, sensual appearance. Chin augmentation can also be very beneficial at improving balance and symmetry among your facial features, bringing out a recessed chin and giving your face a stronger aesthetic structure. These procedures can have beautiful results when performed on their own, or as a complement to other facial rejuvenation treatments. With lip augmentation procedures, you can give your lips a fuller, sexier, and more shapely appearance. Dr. Vartanian has a unique method of injecting in multiple layers in the lips for results that are natural, long-lasting and based on your desired lip shape. Lip augmentation can have an aesthetic effect on your entire facial appearance, especially for patients who have extremely thin lips. The treatment is performed by injecting a dermal filler (like Restylane® or JUVÉDERM®) into the lips to achieve the desired cosmetic result. Prior to injection, Dr. Vartanian discusses with the patient which areas of the lip need to be enhanced. The lip is then numbed by a strong numbing cream. In some cases, additional local numbing injections can be performed to further numb the lips. Next, using a gentle injection technique, the lip is carefully injected with Restylane or JUVÉDERM products that contain numbing medicine (lidocaine), hence numbing the lip while enhancing. After the first injections, the lip becomes more and more numb. The enhancement results are instantly visible. In general, it may take several days to a week before all of the lip swelling subsides fully. After lip injections, all normal activities can be resumed. This includes wearing lipstick, eating, drinking, etc. Depending on the dermal filler that is used, results can last between six to twelve months. The effects of lip injection augmentation can typically be maintained with occasional follow-up treatments. Lip injections are also useful in patients as an anti-aging treatment. As we age, the lips become thinner and lose some of their fullness (volume). As such, replacing this lost volume can bring back a more youthful appearance to the lips. In most cases, small amounts of a dermal filler (like Restyane or JUVÉDERM) can be used bring back the youthful look of the lips without necessarily enlarging them. The fine lines around the mouth, commonly referred to as smoker’s lines, can also be corrected with careful filler injections to fill in these areas. 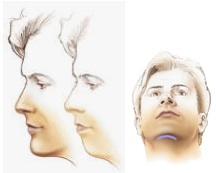 A weak chin may be undesirable and can give the appearance of a larger nose or a shorter neckline. In males, a recessed chin may lead to a false perception by others of timidness or weakness. By augmenting the chin, we can give overall balance to the face. Dr. Vartanian explains, “Like a picture frame, the well-proportioned chin can frame the face and give it definition and balance.” An underdeveloped chin is often not recognized by the patient. Using computer imaging software we can demonstrate the effects of making the chin bigger or smaller. Although frequently done as an isolated procedure, chin augmentation can place the finishing touches on other facial surgery. In some cases, the use of chin implants can accentuate the overall improvements experienced from a rhinoplasty or facelift. Patient satisfaction after chin implantation is usually very high and recovery times are typically minimal. Chin implants can be performed in the office under local anesthesia (with no need to be put to sleep) in about one hour’s time or under deeper anesthesia in a surgicenter. Most patients can return to work within a day or so, even though some chin swelling and discomfort may be present. Dr. Vartanian uses a number of custom size-fitted chin implants to create a natural and beautiful augmentation result. During the consultation process, Dr. Vartanian can show you the size and exact type of the chin implant recommended. If you would like more information on lip augmentation or facial implant procedures, please contact us today. Dr. Vartanian will be happy to meet with you for an initial consultation to discuss your options and answer any questions you may have.